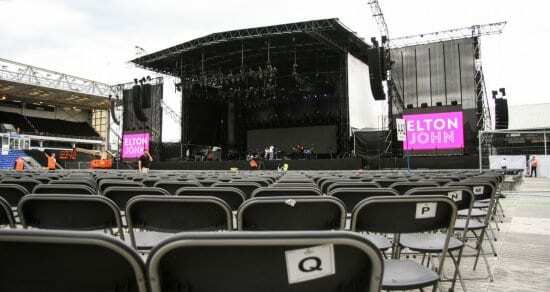 We offer a range of flat seating products, designed to maximise the use of space in temporary event environments. Our temporary events seats are easy to install and transport and can be used in a variety of layouts to suit any kind of large scale event/concert. 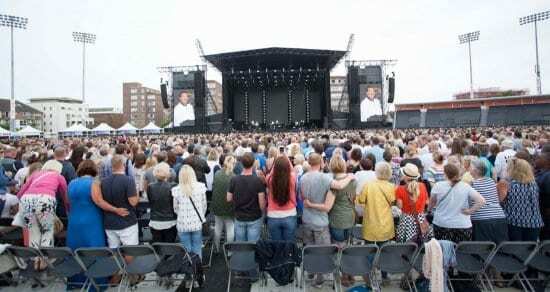 Ideal for indoor and outdoor concerts and events where space is at a premium, our Flat Tip-Up seats utilise a quick to install weatherproof plastic seats secured with a unique modular floorbar arrangement. The flat tip-up seats use less space than a conventional flat chair and provides a totally rigid seating solution. Our cost-effective Samsonite seating system is the ideal solution for concerts and conferences requiring a fast installation and removal time. Hard wearing, comfortable and economic, the folding polypropylene chairs can be used for indoor or outdoor occasions and fold flat for economic storage, transport and handling. Why choose our Flat Seating? Our cost-effective flat seating systems offer the ideal solution for concerts and conferences requiring a fast installation and removal time. They are hard wearing, comfortable and economic, the folding chairs can be used for indoor or outdoor occasions, they fold flat for economic storage, transport and handling. The flat tip-up seats use less space than a conventional flat chair and provides a totally rigid seating solution.